I hope you are all doing well. By way of introduction, we (Ken and Marilyn Koll) took an Engadine self-guided trek last year. A wonderful experience to say the least. I wanted to share a photo of Soglio with you. 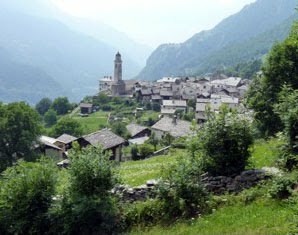 I have seen several Soglio pix on your site but nothing from this perspective. It really captures the hill town structure. I liked it enough to have a large print made. Anyway, I wish we were traveling with you this summer. The Engadine Trek really raised the vacation bar for me. Editor’s note: This is the view looking toward Italy. Spin around 180 degrees and you’ll see the rugged Sciora Range in all its glory. Thanks Ken!